Yankees pitcher Masahiro Tanaka and Cubs pitcher Jake Arrieta are Box-Toppers Players of the Game in Wednesday’s League Championship Series games. Yankees pitcher Masahiro Tanaka struck out eight over seven innings, allowing three hits and one walk, as the Yankees take a 3-2 lead in the best-of-seven game series. Tanaka had 11.4 Box-Toppers points in the regular season, 23rd among all players, eighth among AL pitchers. It is the second time this postseason he has earned Player of the Game honors. He was also Player of the Game in the AL Division Series Game 3 on Oct. 8 in the 1-0 win over the Indians with a Box-Toppers game score of +10.0 (7IP 3H 0R BB 7K). He is the fourth player to earn Player of the Game honors twice in the 2017 postseason, joining Dallas Keuchel of the Astros and Kenley Jansen and Yu Darvish of the Dodgers. Gary Sanchez had the highest Box-Toppers game score among Yankees batters of +1.0 (HR 2-4 R 2BI). Astros starting pitcher Dallas Keuchel had a Box-Toppers game score of -3.8 (4.2IP 7H 4R BB 8K L). Game 6 of the series is Friday in Houston. See Box-Toppers ALCS series preview with player-by-player matchups. A listing of all Yankees and Astros players active with those teams at season’s end who earned Box-Toppers points during the 2017 season can be found here. Cubs pitcher Jake Arrieta struck out nine over 6 2/3 innings, allowing one run, three hits and five walks, as the Cubs kept the Dodgers from sweeping. The Dodgers now lead the best-of-seven game series, 3-1. Jake Arrieta had 6.7 Box-Toppers points in the regular season, 110th among all players, 38th among NL pitchers. In 2015, Arrieta was Box-Toppers Player of the Year, leading all players with 29.1 Box-Toppers points. In 2016, he ranked ninth among all players with 15.7 points. Arrieta had a Box-Toppers game score Wednesday of +5.2, highest among Cubs players. Javier Baez had the highest Box-Toppers game score among Cubs batters of +3.0 (2HR 2-3 2R 2BI). Dodgers pitcher Alex Wood had a Box-Toppers game score of +1.2 (4.2IP 4H 3R 0BB 7K L). Game 5 of the series is Thursday in Chicago. Dodgers—Clayton Kershaw, 23.1 Box-Toppers points, third among all players, second among AL pitchers. Cubs—Jose Quintana, 15.0 Box-Toppers points, 15th among all players, ninth among NL pitchers. It is a rematch of Game 1 which the Dodgers won 5-2. However, Quintana had a higher Box-Toppers game score than Kershaw in the game, +1.0 vs. -2.9. Kershaw, the dominant regular season pitcher of the decade, has struggled in the postseason. In addition, after starting hot in 2017, earning 20.1 Box-Toppers points by July 4, he fizzled down the stretch, earning only 3.0 more points the rest of the season. He last earned Box-Toppers Player of the Game honors (regular or postseason) on Sept. 1. Quintana, by contrast, has won Player of the Game honors three times since Sept 1 (twice in the regular season and once in the postseason). NLDS Game 1 on Oct. 6—Kershaw started and had a Box-Toppers game score of -2.9 (6.1IP 5H 4R 3BB 7K W) in the 9-5 win over the Diamondbacks. Player of the Game went to teammate Justin Turner with a Box-Toppers game score of +5.0. NLCS Game 1 on Oct. 14—Kershaw started and had a Box-Toppers game score of 0.0 (5IP 4H 2R BB 4K ND) in the 5-2 win over the Cubs. Player of the Game was Dodgers closer Kenley Jansen with a Box-Toppers game score of +5.1. NLDS Game 3 on Oct. 9—Quintana started and was Player of the Game with a Box-Toppers game score of +8.2 in the 3-1 win over the Nationals (5.2IP 2H R BB 7K ND). NLDS Game 5 on Oct. 12—Quintana appeared in relief in the seventh inning and had a Box-Toppers game score of -1.8 (0.2IP H 0R BB K) in the 9-8 win over the Nationals. Player of the Game was teammate Addison Russell with a Box-Toppers game score of +3.0. NLCS Game 1 on Oct. 14—Quintana started and had a Box-Toppers game score of +1.0 (5IP 2H 2R 2BB 4K ND) in the 5-2 loss to the Dodgers. Player of the Game was Dodgers closers Kenley Jansen with a Box-Toppers game score of +5.1. See Box-Toppers NLCS series preview with player-by-player matchups. 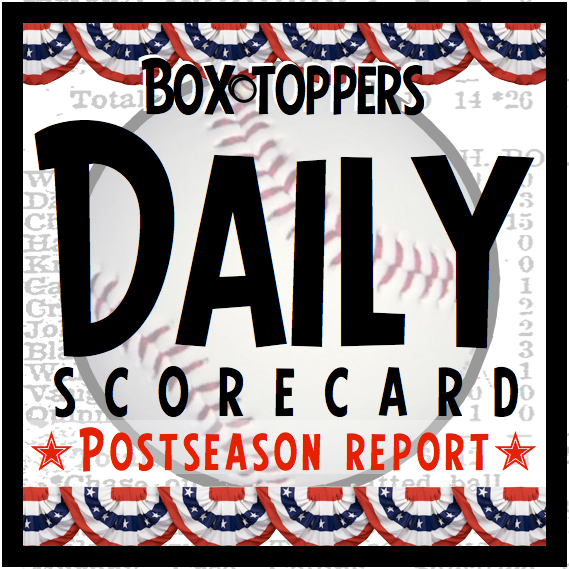 A listing of all Cubs and Dodgers players active with those teams at season’s end who earned Box-Toppers points during the 2017 season can be found here.